The members and guests of Great Eccleston Chapter No 8895, gave Assistant to the Provincial Grand Principals Michael Raymond Threlfall a warm-hearted welcome, when he joined them as the principal guest for their installation convocation at Garstang Masonic Hall. Michael was delighted to have the support of Provincial Deputy Grand Registrar Andrew Bartlett. A toast to the principals. Pictured from left to right, are: Michael Threlfall, Neil Hartley, Scott Devine and Brian Stoddart. After the chapter had been duly opened, the chapter held a ballot to admit John Reid (a past member of Knott End Chapter No 4108, which has now handed in its warrant), as a joining member. The ballot proved successful and John was duly admitted as a member of this fine chapter. Following the entry procession, Michael was warmly greeted by first principal Harry Robinson. In response, Michael retorted that he was new to this role, but was looking forwarded to the ceremony as he was sure it would be a fine one. 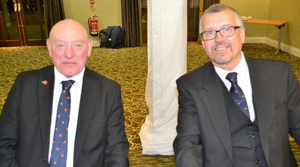 The installation convocation saw Brian Stoddart installed into the third principal’s chair by Neil Hartley, who received his installation into the second principal’s chair by Scott Devine. Scott was in turn placed into the office of first principal in fine manner by Harry Robinson. The robe addresses were admirably delivered by Les Newlands (first principal), Steve McClintock (second principal) and Jonathan Slee, (third principal). As the ceremony drew to a close, Michael was pleased to bring to the principals and the chapter the greetings and best wishes of the Grand Superintendent Tony Harrison. On behalf of Tony, he congratulated the three principals on a fine ceremony, which had been carried out in a very dignified manner, especially as it was the first time for all them in their respective chairs. Michael also proffered congratulations to Harry and the chapter DC Steven Hogg. Michael was delighted to receive notice of charitable disbursements totalling £776.50, which will be sent to the MCF 2021 Festival. 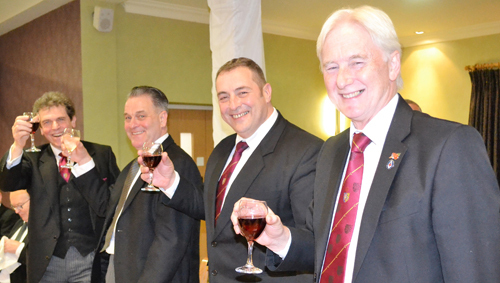 At the festive board held in the Wyrebank Banqueting Suite, Michael was able to give his own personal greetings and congratulations to the new principals and the companions of the chapter. He also wanted to convey his compliments to the companions who had undertaken to present the robe addresses with such distinction. The much-praised Harry Robinson (left) and Steven Hogg. Michael also took the opportunity to update the companions on the latest initiatives of the Province. In speaking about the MCF 2021 Festival, he added how grateful he was on behalf of the MCF, for the chapter’s donation. If for any reason the companions present had not yet made a pledge to donate to the festival, it was Michael’s wish that they consider doing so, it was a very worthy cause. Michael also mentioned the on-line learning site called Solomon, which he encouraged all to use, as well as some of the new initiatives that were being planned by the Royal Arch cabinet. Following an excellent toast to the three principals by Harry Robinson, a delightful performance of the ‘Principals Song’ was given by Fred Fox, with accompaniment by David Tattersall. Responding to these tributes, first principal Scott Devine, who is also the Lancaster and District Vice Chairman, thanked a number of visiting companions for their help in making the evening such a success, including Fred Fox, David Tattersall and the Group Publicity Officer Paul Thompson. Scott continued by expressing his delight at the resurgence of the chapter and how he felt that it was now in a good position to continue moving forward. Much of this success he put down to Harry and the chapter DC Steven Hogg. He was especially praising of how Harry had conducted himself throughout his year as first principal, always with a smile on his face. After Scott had given his final thanks, it was announced that the raffle had raised the splendid sum of £167. Pictured from left to right, are: Andrew Bartlett, Neil Hartley, Scott Devine, Michael Threlfall and Brian Stoddart.